It is the twenty-third century. On the planet Vulcan, a crisis of unprecedented proportion has caused the convocation of the planet's ruling council -- and summoned the U.S.S. Enterprise from halfway across the galaxy, to bring Vulcan's most famous son home in its hour of need. As Commander Spock, his father Sarek, and Captain James T. Kirk struggle to preserve Vulcan's future, the planet's innermost secrets are laid before us, from its beginnings millions of years ago to its savage prehistory, from merciless tribal warfare to medieval court intrigue, from the exploration of space to the the development of o'thia -- the ruling ethic of logic. 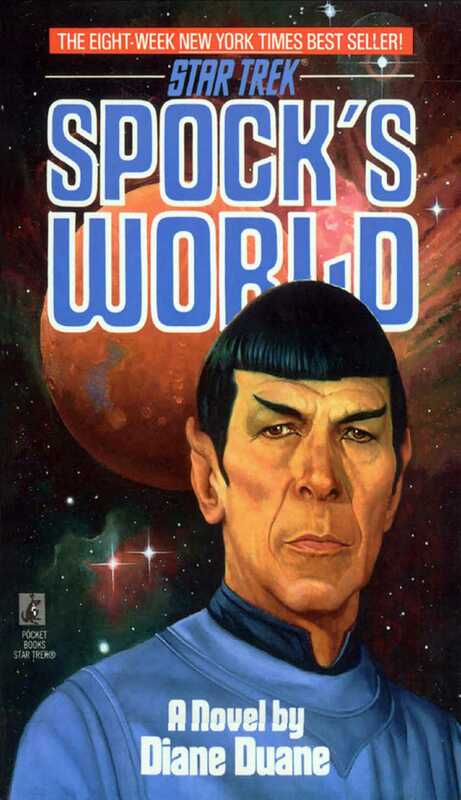 And Spock -- torn between his duty to Starfleet and the unbreakable ties that bind him to Vulcan -- must find a way to reconcile both his own inner conflict and the external dilemma his planet faces...lest the Federation itself be ripped asunder. Diane Duane, author of three previous bestselling STAR TREK novels and an episode of the new STAR TREK NEXT GENERATION® television series, as well as countless other bestselling science fiction and fantasy novels, has crafted a tale of unprecedented scope and imagination, at once a generations-spanning historical novel and a thrilling science fiction adventure. Position yourself in the right place -- on the surface of the moon, say, somewhere near the slow-moving dayline, or in one of the L5 habitats swinging in peaceful captivity around the world -- and you can see it without any trouble: the old Earth in the new Earth's arms. Some people prefer her that way to any other. Not for them the broad blue cloud-swirled disk, all bright and safe and easily seen. They want mystery; they want the Earth's nightly half-bath in the old dark. She always emerges, but (to these people's relief) she always dips in again -- the blue fire fading away down through the spectrum, the rainbow of atmosphere's edge, down through the last flash of crimson, to black. And when she does, the stars come out. Faithful as the other, farther stars, in steady constellations, they turn as the night that holds them turns -- he splatters of spilled-gem light that are BosWash, Ellay, Greater Peking, Bolshe-Moskva, Plu'Paris. The great roadways across continents are bright threads, delicate as if spiders of fire had spun them: here and there the light is gentled by coming from far underwater, as in the Shelf cities off the Pacific coasts of Japan and old North America. At the edge, a limb of brightness shows, the sunrise inexorably sliding around the curved edge of things: but the limb is narrow, the merest shaving of pearl and turquoise curving against the breadth of night. And for the time being, night reigns. It takes time to walk right around a starship. Eleven decks in the primary hull, twelve in the secondary, from an eighth of a mile of corridors per deck to maybe two or three -- the old simile comparing a starship to a small town becomes more obviously true than ever to someone determined to do the hike. Jim, though, didn't mind how long it took, and he did as much of it as time allowed, every time he came aboard after a refit. This time he altered his usual routine a little. After all day stuck down at Fleet, he thought, I'm entitled to a change of pace. Bloody desk pilots...But a second later he put away the annoyance: he had what he had gone for. Jim laughed to himself, and shortly thereafter beamed up via the cargo transporters, along with a shipment of computer media, toiletries, and medical supplies. Cargo Transport was a more pleasant place, in some ways, than the usual crew transporters. The huge room was in the space next to the shuttlecraft hangars, and needed to be, since anything too big to ship up any other way, from warp-engine parts to container cargo, wound up here. The place tended to be noisy and busy any time the ship was near a planet: at the moment, it was a vast happy racket, boxed and crated and forceshielded matériel being carried in all directions on gravflats of varying sizes. Jim got down Off the pads in a hurry to avoid being run over by a couple of G-flats the size of shuttlecraft, and then paused on the loading floor, seeing who was maneuvering the flats by him -- two Earth-human crewmen, a small wiry auburn-haired man and a tall dark-haired woman with a Valkyrie's figure under a cargoloader's coverall. "Mr. Matejas," he said, "Mz. Tei," and as they heard his greeting and realized with surprise who he was, they started to come to attention. He waved them off it. "As you were. How was the engagement party?" The two of them looked at each other, and Jorg Matejas blushed, and Lala Tei chuckled. "It was terrific," she said, shaking her red hair back. "Everybody had a great time, especially the Sulamids...Rahere and Athene got into the sugar, and you know how Sulamids are about sugar, it was a riot, their tentacles got all knotted, and it took us about an hour to get them undone. Sir, thank you so much for the 'gram! Jorg's mom nearly went to pieces when Fleet called and read it in the middle of the party, she was so excited..."
Jim smiled, for that had been his intention. One of his more reliable sources of gossip had let him know that Mr. Matejas's mother was very uncomfortable about her son marrying someone holding higher rank than his. Jim had responded by studying Jorg's record very carefully, noting that he was somewhat overdue for promotion, and then correcting the matter...making sure that the news of his promotion hit him during the party, via the addressing of the congratulatory telegram. The source-of-gossip, also present at the party, had let Jim know later that the name signed at the bottom of the 'gram had counted for almost as much as Jorg's jump in grade to quartermaster's mate. Jim had been gratified -- there were apparently times when being a galactic hero could be turned to some use. "You're very welcome." "Sir," Jorg said, "I'm glad we had the chance to see you. I wanted to thank you, very much indeed." "You earned it," Jim said. "Don't think otherwise. If I helped with the timing a little, consider it my pleasure. Meanwhile, how's the loading going?" Jorg heard the when under the "how." "Half an hour, Captain," he said. "Less if possible." Jim smiled more widely, for reasons that had nothing to do with the timetable. "Good enough. Carry on," he said, and went away feeling unusually pleased inside. He strode across the loading floor, and all the way across it was "Good morning, Captain," "Good evening, Captain," and Jim's smile got broader and broader: not at the inconsistency among greetings, for the ship was back on cruise shift schedules again, three shifts relieving one another, and some people were working overtime. Out into the corridor, and it was the same thing, when he said hello to his people or they said hello to him: no "Admiral," nothing fancy, just "Captain" again, as God intended. It was a great relief. As he walked the halls, Jim acquired a grin that would not go away. The long afternoon in Fleet Admiral Nogura's office had been trying, but the results had been worth it. Twenty hours after beaming up from the Willow Grove, eight hours after beaming over to Fleet to handle the inevitable paperwork involved with a new set of missions, he was happily demoted to captain, effective immediately, revocable at Fleet's discretion. Some people would not have understood it, this desire to be de-admiraled. But most of those people weren't naval, or had lost touch with the naval tradition that was so much a part of Starfleet. And Nogura, in love (Jim told himself tolerantly) with the power of the Fleet Admiral's position, couldn't understand it either. It's not his fault, Jim thought. He's been one too long, that's all. Admirals, from time immemorial, didn't command anything but fleets: they managed strategy and tactics on a grand scale...but Jim wasn't interested in a scale quite that grand. Captains might be obliged to give admirals rides to where they were going, and to obey their orders: but for all that, the captains were more in command than ever an admiral was. There might be more than one admiral on a ship...but never more than one captain. Even as a passenger, another captain would be "bumped" a grade up to commodore -- partly out of courtesy, partly to avoid discourtesy to the ship's true master. It was real sovereignty, the only kind Jim cared for, and he was glad to get rid of the extra braid on his arms and settle into the happy business of interacting, not with fleets, but with people. Jim did that for the hour it took him to cover the manned parts of the engineering hull, stopping last at Engineering. He strolled in, and almost immediately began to wish he hadn't. Pieces of the backup warpdrive were all over the floor, or hovering on placeholders, and Scotty was thundering around among his engineering ensigns, shouting at them. Fortunately, he was doing so in the tone of voice that Jim had eventually learned meant everything was going all right, and so he relaxed and stood there for a bit, enjoying the spectacle. "Ye can't put a drive together as if it was a bitty babbie's picture puzzle, for pity's sake," Scotty was telling the air with genial scorn, as junior crewmen scuttled around him with calibrating instruments and tools and engine parts, looking panic-stricken. "There's got to be some system to't. You can't bring up the multistate equivocators until the magnetic bottle's on-line, and where's the bottle then? Ye've had ten whole minutes! -- Afternoon, Captain," he added. Jim smiled again. "Problems, Scotty?" he said, not because he perceived any, but because he knew Scotty expected that he would ask. "Ah no, just a drill. What if these poor children have to reassemble a warp engine by themselves some one of these days, with only impulse running and a pack of Klingons howling along behind 'em? They've got the brains for it: would they be on the Enterprise if they didn't? Best they learn how now. We'll be tidy again in twenty minutes. Or I'll know the reason why!" Scotty added, at the top of his voice. The scuttling got much more frantic. Apparently Scotty's crew considered the chief engineer in what Jim had heard them describe as "one of his moods" to be slightly more dangerous to deal with than mere Klingons. Jim nodded. I might as well get out, he thought; they look nervous enough without me watching as well. "Officers' briefing at point seven, Scotty," he said. "Aye, I checked my terminal for the schedule a while back." Scotty looked around him with satisfaction. "Just before I crashed the Engineering computers. Jim was astonished, and looked around him...then felt mildly sheepish, for he'd never even noticed that every screen in the place was blank. "They're putting this thing together without the computer prompts? Not even the emergency systems?" Scotty shrugged. "Who's to say we could guarantee them that the backup systems would be working in an emergency?" he said. "Even backups fail. But their little brains won't...if we train them properly. FIVE MINUTES!!" he told the world at large. Then looking around the floor, he said, "By rights I should evacuate the place and make them do it in pressure gear. If her side was blown this far open that they'd have to reassemble from scratch, they'd need that practice." Jim shook his head, feeling sorry for this Engineering crew, all doomed to be turned into mechanical "geniuses" like their mad teacher. "Talk to Spock about scheduling, if you feel the need." Scotty nodded, and together he and Jim stood and watched the matter-antimatter mix column being put together from the field generators up. "By the bye, Captain, have you scheduled the crew briefing yet?" Jim patted Scotty on the back. "I'm off, then," he said. Scotty eyed him suspiciously for a moment. "You've picked up a bit of an Irish accent," he said. "Might not be strange," Jim said. "The people I was with were claiming that my family wasn't Scots. Sorry, " he said, as Scotty looked at him with an expression of shock that was only partly faked. "Really. They claim the name Kirk was an Anglicization of O'Cuire. It would explain why my family was in the east of Ireland to begin with..."
"Those people will say anything," Scotty said, and grinned a little. "Get on with ye. Sir." Jim headed out. "THREE MINUTES!" the voice roared behind him, as he got to the turbolift and stepped in. "Where to, Captain?" the lift said to him. The place looked a little strange when the lift doors opened on it, as home often does when one's been away from it for a while. Jim stepped out, nodded greeting at Uhura and Sulu, who gestured or smiled hello at him. He waved them back to what they were doing and glanced around to the Science station. Spock was bent over it, making some adjustment. "Readout now," he said, straightening and looking over his shoulder at the large, shaggy-fringed rock that was sitting in the center seat. Some of those glittering fringes stroked the open circuitry of the communicator controls in the seat's arm. "Point nine nine three," said a scratchy voice from the voder box mounted on the rock's back. "A nice triple sine." "'Nice'?" said Spock. Jim raised an eyebrow: you could have used Spock's tone of voice to dry out a martini. "Within high-nominal limits," said the rock, and there was a definite smile in the voice, despite the fact that the voder should not have been able to convey emotion. "A third-order curve, sir. Skew no more than e minus zero point two two four six. No crystal infrequency, no parasitic vibrations, signal loss within accepted IEEE and CCITT parameters, layback less than point zero two percent, hyperbolic -- "
"That should be sufficient, Mr. Naraht," Spock said, looking over at the captain with a slight wry expression. "Mr. Naraht," Jim said, stepping down beside the helm. Lieutenant Naraht was a Horta, a hatchling of the original Horta on Janus VI: one of an intensely curious species that could no more have stayed out of space, once they came to understand it, than they could have stopped eating rock. Jim had watched Naraht's career since he was transferred to the Enterprise with both interest and pleasure: the Horta had gone from eager, avid "space cadet" to seasoned officer in a very short time...no surprise, considering some of the things he had been through, with the rest of the crew, since he came aboard. Now Jim patted the back of the center seat and said, "Trying her out for fit, mister?" There would have been a time when the remark would have made Naraht wriggle all over, embarrassed -- and the sight of a quarter-ton of living stone, the shape and color of a giant fringed asbestos pan pizza, being embarrassed, had occasionally been memorable. But now Naraht merely looked up -- at least Jim felt he was being looked at, though he was unsure as to how -- and said, "Respectfully, sir, I think I would need something a little bigger. There was some distortion showing up in the commcircuits, that was all, and Mr. Spock asked me to assist him in isolating it." Jim glanced over at Spock. "I could have sworn that Mr. Naraht had almost given you more data than you needed." "There is no such thing as too much data," Spock said calmly, "but there is such a thing as unnecessary detail. Nonetheless, the job is adequately completed. Thank you, Mr. Naraht." "My pleasure, sir," said the Horta, and slipped down out of the helm onto the floor with his usual speed and silence, always surprising in someone so massive. "Captain? Your conn?" "Thank you, Mr. Naraht," Jim said, and sat down. The seat was very warm -- not surprising: McCoy usually referred to the liquid-mineral complex that Naraht used for blood as "fluorocarbonated lava with asbestos hemocytes." "Sir," Naraht said, and shuffled off into the lift to be about his business. Jim sat back in the command chair, and Spock stepped down beside him, holding out a padscreen. Jim glanced down it, tilted the pad slightly to scroll through it. It was a very condensed, compressed version of the ship's schedule for that day, parts of it flowcharted where an activity of one ship's department was dependent on some data or action by another. Most of it he had already seen, at Fleet, when signing for his orders and Enterprise's "sailing papers" and authorizing the usual too-numerous vouchers, invoices and inventories. "Of course," said Spock. "All transfer personnel are aboard and all assigned personnel are at post or accounted for. Our two scheduled rendezvous, with Swiftsure and Coromdndel, are estimated on-time in one-point-one-three and one-point-six days respectively. " "Fine." Now Jim's eye lighted again on the listing that scheduled the senior officers' briefing, and he glanced up at Spock. Spock bowed his head slightly. "I will be doing the mission situation analysis," he said. "Thank you. You do seem better qualified than anyone else..."
Spock got an expression that would hardly have seemed like anything on a human face, but on a Vulcan was a most astonishing look of irony. "I am certainly considered by some to be part of the problem, " he said. "It seems only appropriate to attempt to be part of the solution." Kirk nodded, scanned farther down the list. "Crew mixer's starting a little late." "I would suspect this is so that the senior officers can attend," Spock said. "Right." On Enterprise, as on many another ship, there was a tradition of a first-night-out "mixer" party for the crew, so that people could get together and debrief about what they had done on leave and catch up on personal business before getting down to the serious business of working on a starship. Some civilians had considered this frivolous, when they found out about it -- until surveys done by the Fleet Surgeons General proved that if the debriefing didn't happen formally, first night out, it tended to stretch out across the next month of travel time, impairing the crew's efficiency as it did so. With the release of that data, the complaining stopped. And the Enterprise always threw a very good party. "It had better be good," McCoy would say, only half joking, since Recreation was considered a part of Medicine, and the chief of Recreation reported directly to him. "Captain," Uhura broke in, looking over her shoulder at Jim, "a private message has just come in for you -- the computer just finished decoding it. Shall I hold it?" "No need," Jim said. "Put it here." He held up the padscreen. Uhura touched a couple of controls to dump the material to the commlink in the pad. Jim hit the combination of shorthand-keys for "newest," and the message came up. Spock politely looked the other way. "No," Jim said. "Take a look at this, Spock..."
Jim stared at the pad. Lord, how I hate public speaking...Still, this is something worth speaking about. "Uhura," he said, "send a reply. My great respects to T'Pau, and I will be delighted to speak -- no, make that honored. Respectfully yours, signed, etcetera etcetera. Copies of the message and the reply to Starfleet, as well." "Aye aye, sir," Uhura said. Jim brought the ship's schedule back up on the screen of the pad and looked up at Spock. "Anything further here that needs my attention?" Spock reached over Jim's shoulder and tapped the pad: it cycled ahead to one entry. "A discretionary. Ship's BBS has asked for the release of more core memory." Jim looked at the already substantial figure in gigabytes that the ship's bulletin board system was using already, and the fat increase being requested -- almost double the present memory storage. "What does Dr. McCoy say?" Spock glanced momentarily at the ceiling, as if it might assist him in his phrasing. "He says that the Rec chief thinks it would be a good idea, and in general he agrees, especially as regards the message net -- but himself he thinks Mr. Sulu has already blown up more of Starfleet than is good for him on the 'damn bloodthirsty war games machine.'" Spock glanced mildly at Sulu's back: the helmsman was chatting with Chekov about a restaurant somewhere. "Apparently he has been experimenting with Klingon ship design in the BBS's ship exercise simulator. Improving both their design and their performance, if the comments of the people from Engineering are any indication. The Klingon ships in the simulation are apparently doing much better after 'Sulu refits.'" "How have Mr. Sulu's efficiency ratings been?" said Jim, very softly. "All above point eight and rising steadily," Spock said, just as quietly. "And Bones hasn't scheduled him for a psych profile of any kind." "So basically, Bones is just grouching off." Spock looked at the captain as if he had announced that space was a vacuum: his look said both that the statement was obvious, and one about which a great deal more could be said. "In other regards," Spock said after a moment, "message traffic on the BBS has been up significantly in recent days." "Are you recommending the augmentation?" Jim said. "Logically," Spock said, "it would be a reasonable assumption to expect crew stress levels, and therefore volubility, to increase over the mission ahead of us. And it would be illogical to withhold what will be a valuable 'safety valve.'" Jim cocked an eye at the pad, then tapped in an authorization code on the shorthand keys at the bottom. "Give them half again what they asked for." He let the pad scroll to the bottom. "I want a look at those refits, though. People elsewhere may be having the same ideas, if you get my drift." "Affirmative. Mr. Tanzer has installed one of the optimum refits in the small simulation tank in Rec One." "Tonight, then, at the party." Jim got up, handed Spock back the pad. "I'm going to get something to eat. I'll see you at the briefing." The communicator whistled. "Sickbay to Bridge -- "
Jim nodded at Uhura. "Bridge," he said. "What is it, Bones?" "Ijust got the most interesting piece of mail -- "
"From T'Pau?" Jim said. He glanced at Spock. Spock put an eyebrow up. "You too, huh?" There was a moment's silence, and then McCoy said in an aggrieved tone, "Dammit, I'm a doctor, not a -- "
"Belay it, Bones. What's your answer?" There was another pause, then a sigh. "Dammit," McCoy said, "when did I last turn down an argument with a Vulcan? I can hardly pass up one with the whole planet." "Noted and logged," Jim said. "We'll talk about it later. Bridge out." He turned toward the helm. "Mr. Chekov!" "Sir?" said the navigator, turning in his seat. "Plot us a course for Vulcan, warp two. Mr. Sulu, take us out of the system on impulse, one-tenth c, then warp us out." "And if you see any Klingons," Jim added as he paused at the bridge entry, waiting for the lift doors to open, "for pity's sake, don't stop to sell them new warp engines! No need to make yourjob harder than it is..."
Sulu's chuckle was the last thing Jim heard as the lift doors shut on him. The officers' mess was one of the more enjoyable parts of the ship, and not merely because it was for the officers. One could make a case that numerous parts of recreation and the arboretum were much nicer. But there was no faulting the view from the officers' mess. It was on the leading edge of the disk, with real windows, not viewscreens: floor-to-ceiling windows that gave the illusion of sitting at the twentythird century equivalent of a ship's prow. At sublight, the stars naturally didn't seem to move, but Sulu was apparently opting for the scenic route out through Sol system, the so-called "Grand tour," which more than made up for it. Jupiter swain slowly into view, a huge striped-candy crescent, then grew gibbous, then full, as Sulu slipped the Enterprise around the planet's curvature, slowly enough to pick up a little slingshotting from gravity, swiftly enough not to let the impulse drivers disturb or be disturbed by Jupiter's radiopause. Various moons whipped or lazed around the planet like thrown ball bearings as Enterprise passed her. Saturn was a yellow white star in the distance, growmig in the darkness as Sulu made for her. Jim pushed his plate aside, having finished with his steak, and puffed the table screen close again on its swinging arm. Holding on it, amber on black, was a page of data. No Dropouts! No lost meaning! Now what the devil is a b'hiva? Jim thought, and kept reading. While on leave planetside (Terra or Luna), did anyone happen to pick up one of the taped or solid "tourist dictionaries" of local languages sometimes sold in souvenir shops, etc? Want to dump the thing? I'll trade you classical music, third-stream jazz, exotica, drama (BBC, RSC, Bolshoi a specialty). Looking particularly for Romanian, Kampuche, tlLow, Eurish (Dalton recension if possible), and other artificials (Anglish, Neolangue, SinoFrancaise, Cynthetic). Thanks! N.J. Still working on her doctoral thesis, Jim thought. Uhura was busy working on improving universal translator theory, mostly by taking the old theory to pieces and putting it back together in shapes that were causing a terrible furor in academic circles on various planets. Jim vividly remembered one night quite a long time ago when he had asked Uhura exactly how she was going about this. She had told him, for almost an hour without stopping, and in delighted and exuberant detail, until his head was spinning with phoneme approximations and six-sigma evaluations and the syntactic fade and genderbend and recontextualization and linguistic structural design and the physics of the human dextrocerebral bridge. The session had left Jim shaking his head, thoroughly disabused of the idea (and ashamed of how long he had held it) that Uhura was simply a sort of highly trained switchboard operator...And as regarded her doctoral thesis, he could have found out simply enough that she was still working on the Earth-based algorithms, just by asking her: but this was a more interesting way of finding out. Cynthetic? he wondered, and made a mental note to ask her about it at the party. He scrolled down through various replies to Uhura's message -- apparently quite a few people had picked up dictionaries that were now (or had immediately turned out to be) useless -- and finally determined to leave these messages for later. "Change area," he said to the screen. "Common room." The screen flickered and gave him another page. It was one of the places he came to find out what his crew was thinking. Messages did not have to be attributed to a name or terminal, but they could not be private. The office of common room system operator rotated through the crew, offered to various members on the strength of their psych profiles in areas like calm reaction to stress and anger. The common room sysop tended to be closemouthed and dependable, the kind of person that others refer to as "a rock." (Once it had actually been Naraht, to the amusement of just about everyone.) Here tempers could flare, awful jokes be told safely, suspicions be aired, rumors be shot down. The common room was sometimes a peaceful place, sometimes a powderkeg. Jim never ignored it. They can't take care of themselves anymore. They can't even take care of a starship if you give it to them -- and now they claim that they're not goodenough for us? Well, **** 'em and the sehlat they rode in on. Jim breathed out. Serious? Or not? The statement mirrored some that he had heard on Earth, as this crisis had built and brewed. He scanned down the page.